Money in the Garage: Do you shop at Target, Walmart or Garage Sales? I love to make bread in garage sale Panasonic bread maker. Had hardly been used, seller said she likes making by hand. I paid $20.00 a couple months ago and we have not bought a loaf of bread from the store yet. I found a device to put the bread in to hold it why I slice it. Paid a $1.00 for this. Life goes on- That's an awesome deal! And there's nothing better then the smell and taste of fresh bread, I am a sucker for it! Eat, bake & save money....you scored a great deal all the way around! 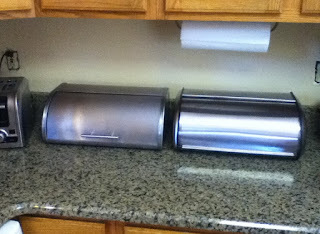 I looked at stainless steel breadboxes at Target and on Amazon for about a year, but was too cheap to take the plunge. I found one for $5 this summer at a yard sale. I was super excited! It still makes me happy, just seeing it on my counter. :-) It's identical to the one I liked at Target, but soooo much cheaper. Kari- You used "Cheap" to describe yourself...."money smart" is the proper description! A garage sale find for only five dollars is super smart and a great find. Since they are growing in popularity, I guess we'll see more and more of the stainless steel bread boxes showing up garage sales. Thanks for writing in and sharing your story...Dude! I am glad you like the bread box story-the best stories are true ones! Thanks for writing in....Dude! I think the Walmart breadbox is much nicer looking. I had a bread box once. I don't think I ever kept bread in it so I got rid of it after a month. WHAT? 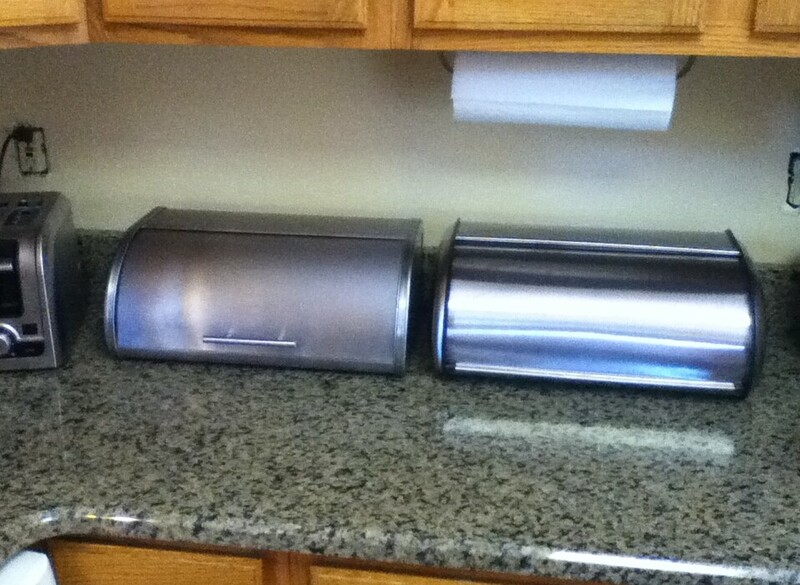 You didn't know about the bread box purchase???!!! ;-) Just kidding. But am wondering - what is your "Team Dude" price point at which you discuss the purchase with each other before purchasing? Is Mrs. Dude as frugal as you are, Dude? I am definitely the more frugal one on MY Team! And I'm with the others - Target over Wal-Mart any time - we even broke down and got the Red Target credit card for the 5% discount on every purchase (and we do pay it off every month, so not an issue). But I can go in there and browse for hours! The others are right - it's just a "happy, oh so happy, place!" and the smell of popcorn and Starbucks Grande mocha-latte-chino-frappe-ding-dong! Susie Q - I saw the box, but never conceived it would be $50 guacamoles!! I had true sticker shock!!! And while Mrs.Dude likes a good deal, (most of the time) I am more diligent (obsessed?) about it! Your description of Target is spot on...popcorn and Starbucks aroma wafting in the air as you enter. It's an irresistible combination-those marketing folks at Target are evil geniuses! Ha!